A Chinook helicopter drops a load of water in front of flames on Thursday evening near Hermosa while battling the 416 Fire. Fire managers say the fire could reach homes in the Hermosa area by Friday night. Firefighting efforts Thursday focused on preparing for structure protection efforts. 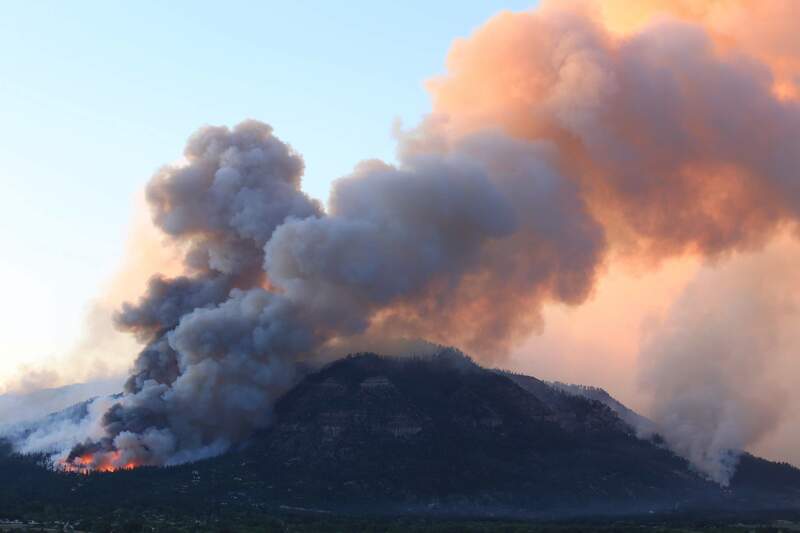 Flames and columns of smoke from the 416 Fire were easily visible Thursday evening near the base of Hermosa Mountain. A Chinook helicopter looks to drop a load of water in front of flames Thursday evening near Hermosa while battling the 416 Fire. Flames from the 416 Fire soar over trees Thursday afternoon near Hermosa. Firefighters prepared for a battle Thursday night as the 416 Fire moved down Hermosa Mountain and flirted with neighborhoods on the lower slopes. Fire managers said the blaze could reach homes by Friday night in the Hermosa area, where an additional 500 homes were evacuated Thursday morning and another 750 homes were placed on pre-evacuation notice. The 5,000-plus-acre blaze put on a show Thursday night, sending up fireballs and well-defined columns of smoke from the base of the mountain. A stream of cars traveled south on U.S. Highway 550, possibly residents who were on pre-evacuation who had second thoughts about staying. Neal Kephart, a fire information official assisting the Type II team managing the blaze, said no structures were endangered as of 8:30 p.m. Thursday, and fire officials are confident enough preparatory work has been done around buildings so that it is unlikely any will be lost. “For some time, crews have been working hard to mitigate the danger around structures, so we feel secure they could control them,” he said. The fire, he said, has not crossed the Hermosa Creek drainage, but it has crossed the Jones Creek Trail and the Hermosa Creek Trail. Burnouts along U.S. Highway 550 were not conducted during the heat of the day, but evening burnouts along the north end of the fire were planned Thursday to strengthen and widen fire lines and to reduce fuels to minimize the danger of spot fires on the highway’s east side. No firefighters have been seriously injured, he said. 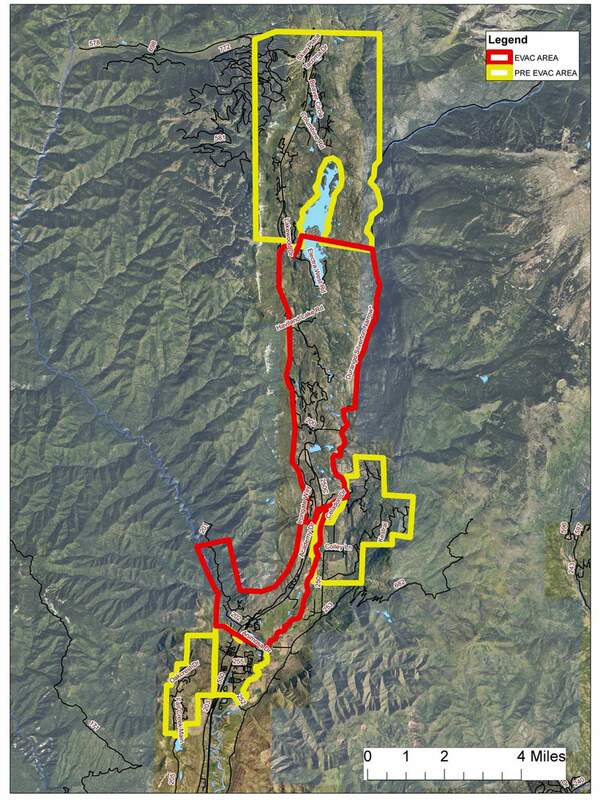 This map shows the evacuation and pre-evacuation areas of the 416 Fire. The fire remained active Thursday, especially on the southwestern side, Kephart said, with torching and crown runs on that end of the fire. Burnout operations were conducted near the Lower Hermosa Campground, and the tactic slowed the fire, he said. Use of slurry, which had not been as effective as hoped earlier this week, resumed Thursday. A power line burned Thursday resulting in loss of power to households in the fire area. La Plata Electric Association said the outage affects 700 households and businesses from Tamarron to the Purgatory area. 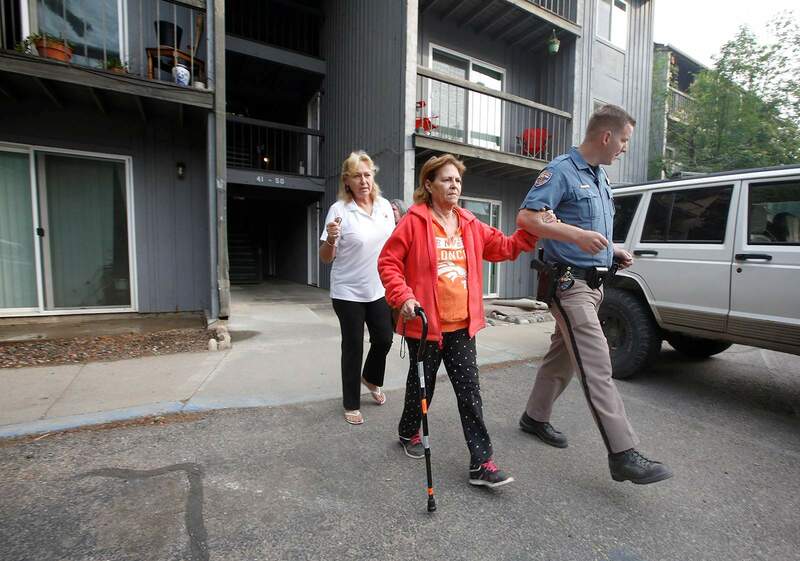 Colorado State Patrol Trooper Brad Spargur escorts a resident from the Animas Village Apartments as Denakay Hutton, site manager, follows Thursday morning north of Durango. 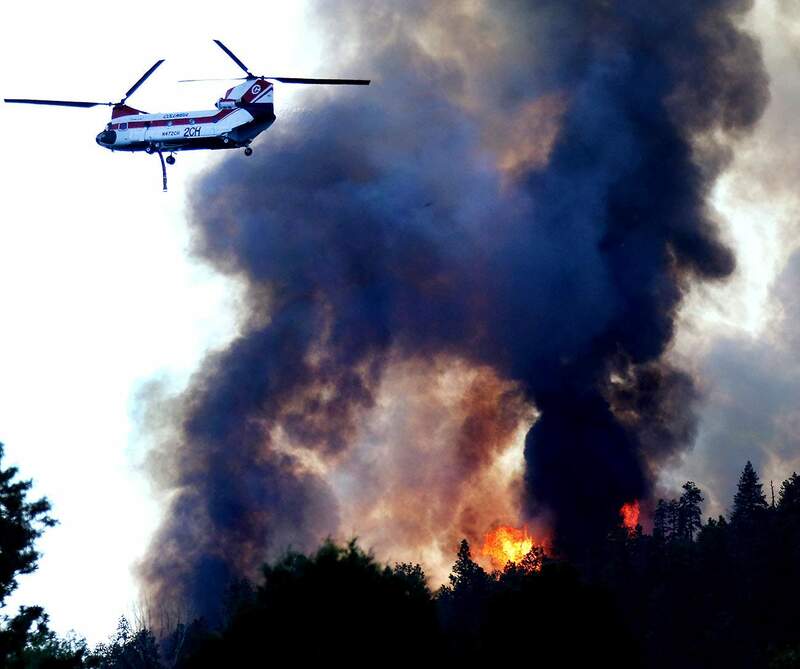 The 416 Fire was more than 5,000 acres in size and could reach homes Friday in the Hermosa area. A news release on the outage reported crews were expected to arrive on scene near Honeyville to evaluate the situation Thursday night, and LPEA is working with emergency personnel to assist with the fire. As expected, hot, dry conditions made Thursday a tough day for firefighters and similar conditions are expected Friday – high temperatures in the mid-80s and humidity levels in the single digits, Kephart said. The fire Friday is expected to move to the west, and Kephart anticipated using air tankers and slurry again, especially on the west end. Thursday’s evacuations were ordered for two reasons: to protect the public and to clear the area for firefighters to work, said Vickie Russo, a spokeswoman for the Type II team managing the blaze. It’s not guaranteed fire will reach residences, but “it’s possible,” Russo said Thursday night. 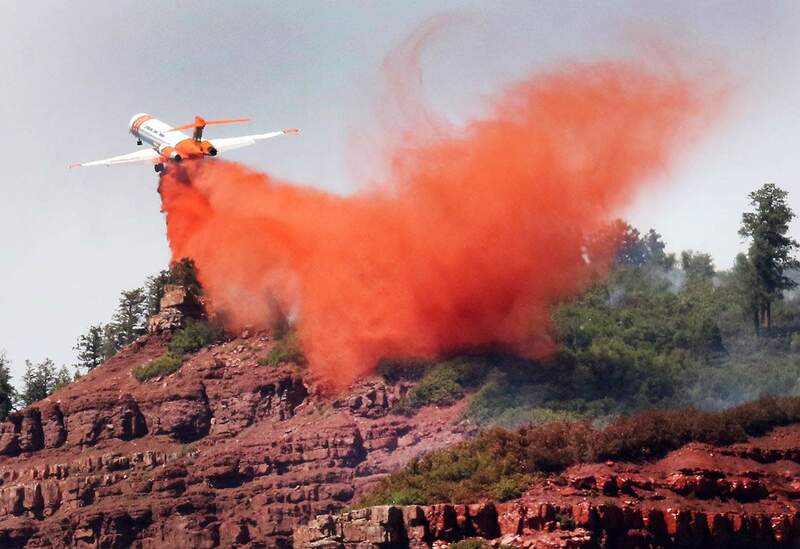 A low pass over Hermosa Mountain shows the skill of an air tanker pilot Thursday afternoon. The 6-day-old fire started about 10 a.m. Friday and had grown to 5,103 acres as of Thursday morning, the most recent estimate available. It was only 10 percent contained. An update on fire size and containment is expected Friday morning. 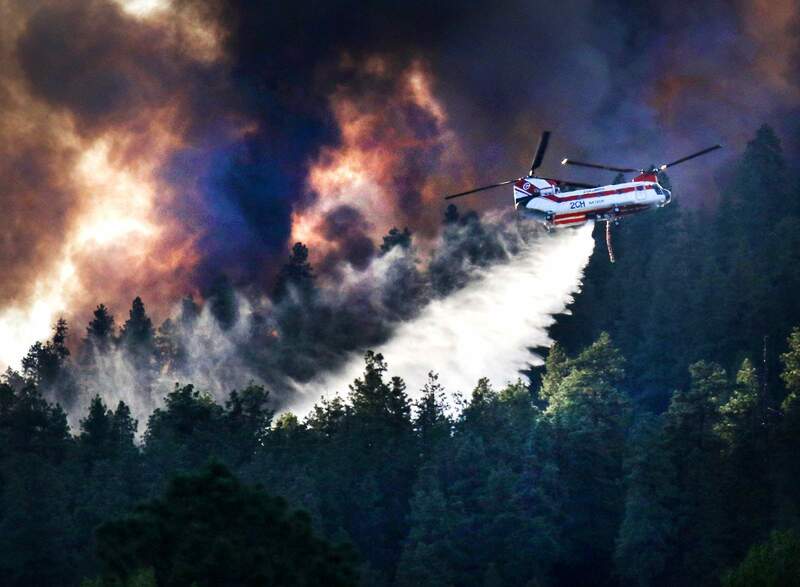 In total, more than 1,000 homes are evacuated and more than 1,500 homes are on pre-evacuation, according to La Plata County. 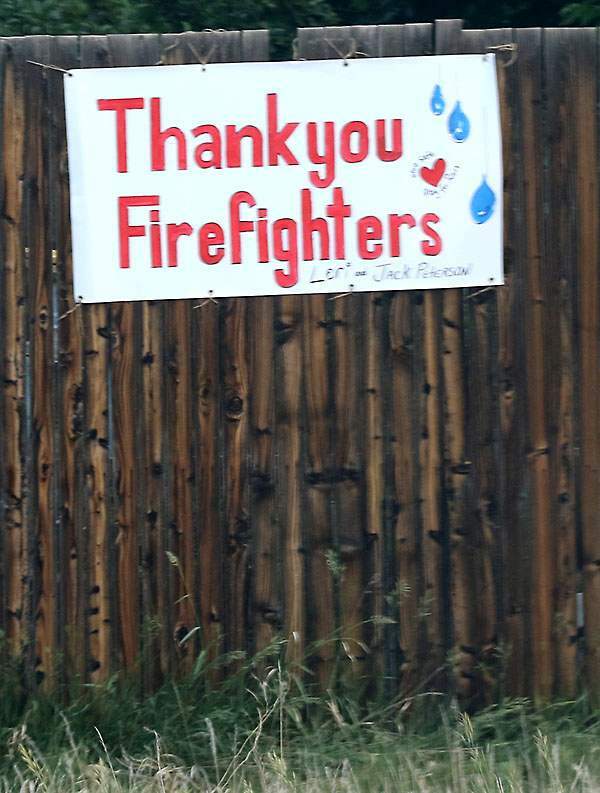 A sign thanks firefighters who are battling the 416 Fire. U.S. Highway 550 is expected to be open from 8 a.m. to 6 p.m. Friday for limited through traffic, meaning drivers can move through the corridor, but they aren’t allowed to stop or drive down side roads. They will be escorted by law enforcement. Otherwise, the highway remains closed between mile markers 32 and 44, according to the Colorado Department of Transportation. A Type I team will take command of firefighting efforts at 6 a.m. Saturday. They arrived for a briefing Thursday evening and will spend a majority of the day Friday “shadowing” the Type II team to learn more about the team’s firefighting efforts. Kephart described “shadowing” as similar to on-the-job training and said it ensures the transition of teams is as smooth and safe as possible. The Type I team brings similar skills as the Type II team but with advanced qualifications to manage larger, more complex fires. Thursday reader photos: 416 Fire The 416 Fire continues to burn Thursday, June 7. 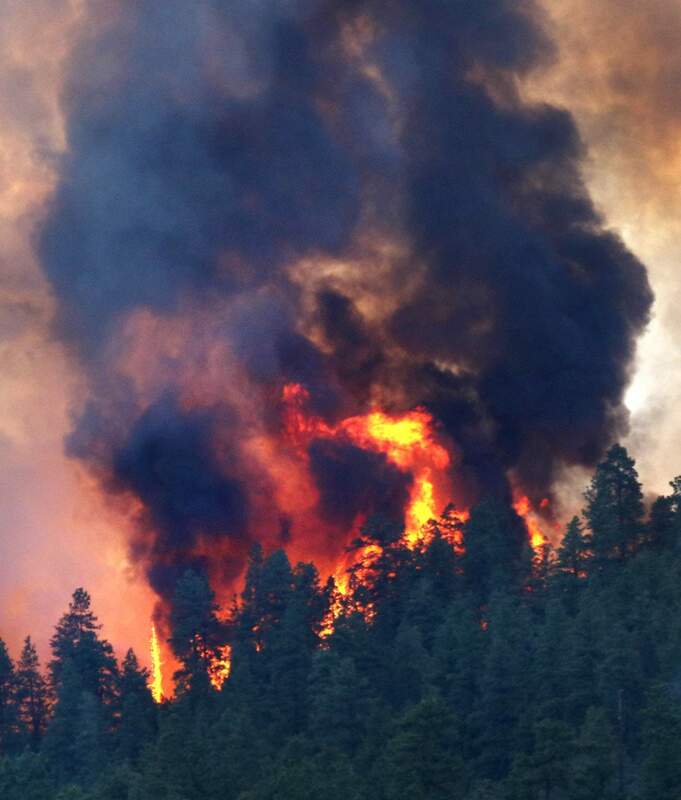 The 416 Fire continues to burn Thursday, June 7. This photo of the 416 Fire was taken from Animas City Mountain at 11:43 a.m. Thursday. This photo of the 416 Fire was taken from Animas City Mountain at 11:13 a.m. Thursday. Community resourcesLa Plata County government hotline for residents evacuating: (970) 385-8700.Livestock can be evacuated to La Plata County Fairgrounds, 2500 Main Ave.Four Corners Back Country Horsemen will assist with horse and livestock evacuations, call (570) 228-1340.The Browning Ranch in Farmington volunteered to host horses during evacuations. Call Chris Maedche (505) 681-3595.Small animals can be evacuated to La Plata County Humane Society, 111 South Camino del Rio.Tips for pre-evacuationFor people who received a pre-evacuation notice, these steps can improve their safety and expedite departure should an evacuation become necessary. Inside the houseGather medications.Pack a bag with clothing and essentials.Shut off air conditioning and fans.Shut all windows and doors before leaving.If you have time, gather paperwork and photographs that cannot be replaced.Outside the houseGather flammable items and bring them inside (patio furniture, children’s toys, door mats, trash cans, etc. ).Move propane barbecue appliances away from structures. Connect garden hoses to outside water valves or spigots for use by firefighters. Fill water buckets and place them around the house.Don’t leave sprinklers or water running; this can affect critical water pressure.Leave exterior lights on so your home is visible to firefighters in the smoke or darkness of night.Back your car into the driveway with vehicle loaded and all doors and windows closed. Carry your car keys with you.AnimalsLocate your pets and keep them nearby.Prepare livestock for transport and plan to move them to a safe location early.Pack food and medications for your pets.InsuranceTake pictures of the interior of your house to remember and document personal possessions.Determine what is sentimental and can’t be replaced.DonationsCommunity Foundation Serving Southwest Colorado is accepting monetary donations for Community Emergency Relief Fund. This fund is set up for broad-based community emergencies in Southwest Colorado. The Advisory Committee is working with government agencies and local businesses to develop a strategy for distributing the funds raised. Efforts will support local people and efforts related to 416 Fire. To donate to CERF, residents can send a check to The Community Foundation, P.O. Box 1673, Durango, CO 81302 or donate online at www.swcommunityfoundation.orgDonations of clothing and household items accepted at Discover Goodwill of Durango, 1230 Escalante Drive.Financial donations can be made to the Community Emergency Relief Fund by calling (970) 375-5807.